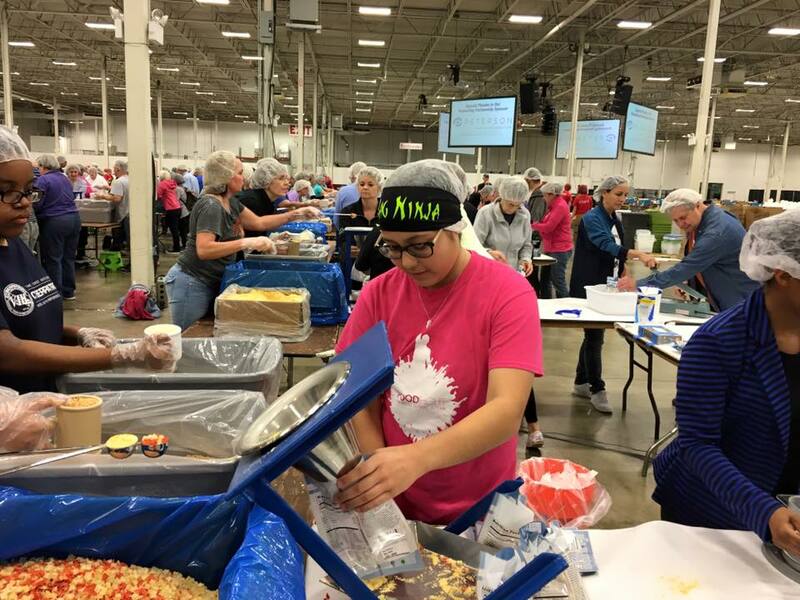 I had SO MUCH FUN at Food Fight 2016, and I was just a worker-bee! I think that people who really came to pack had an even better time, and in the end, 13,000 kids will have an amazing time- because the 5 million meals (5,044,464 to be exact) we packed with Feed My Starving Children will feed them for an ENTIRE YEAR. The whole event was incredible- especially the very last packing session, which originally didn’t have enough people signed up and ended up being FULL and packing 1 million meals in 2 hours (and a little change). I’d call that a God moment, but you can call it whatever you’d like. So what is “Food Fight” (in case you ignored me ranting about it all weekend)? That sweet lady on the left is Kim. Kim works at New Hope Church. 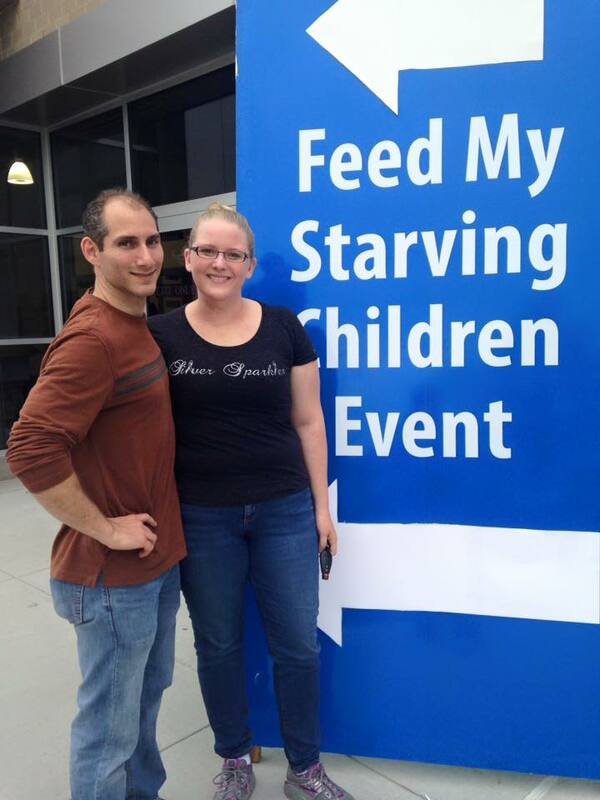 Kim probably likes a lot of things, but two of them are Jesus and Feeding People. Oh, and hair nets. That’s three things. 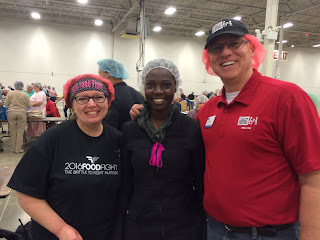 (Incidentally, in the middle of this picture is a lady who grew up eating FMSC meals in Africa and came to pack them for others at our event! The red guy is FMSC Staff). 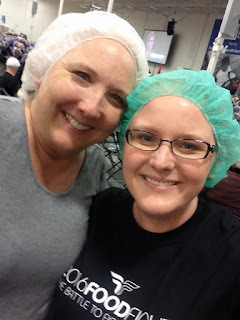 Kim has organized packing events for Feed My Starving Children for the past several years at New Hope and we have loved attending. This year, Kim and New Hope teamed up with the NorthStar Church Network and some other big sponsors to host Food Fight. 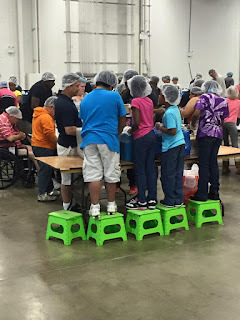 Instead of packing a couple hundred thousand meals at New Hope, they decided to pack 5 Million Meals at the Dulles Expo Center. What does that look like, you might ask? 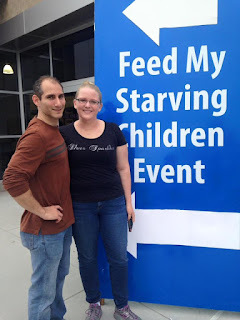 This is my awesome hubby and I going in Thursday night for Certified Volunteer training. 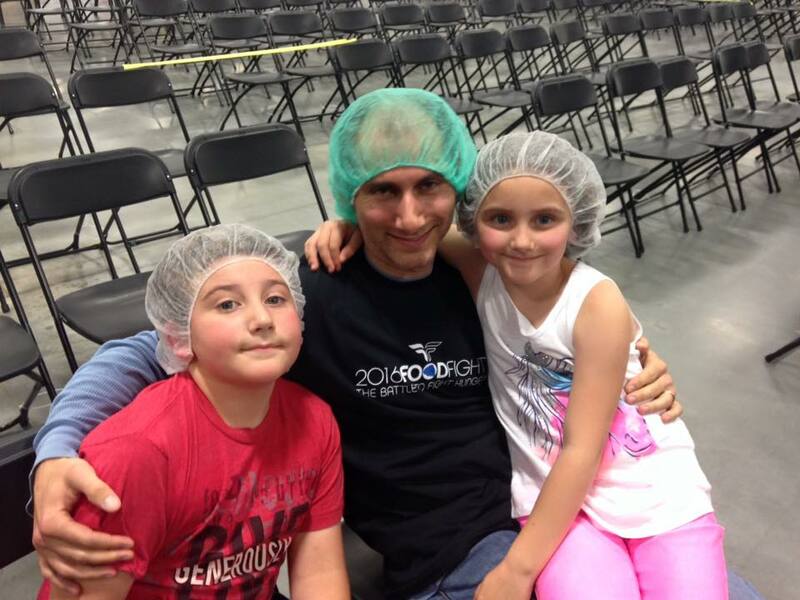 Austin doesn’t go to church with me, so it’s always been really special that he comes for FMSC, and he was willing to take a day off work this year to continue to go with me. We worked all three days of packing and it was amazing. We got to pack a little, too. Our Certified Volunteer Shift was the first to pack Thursday night, and even while we were learning the ropes, we managed to pack our own pallet. 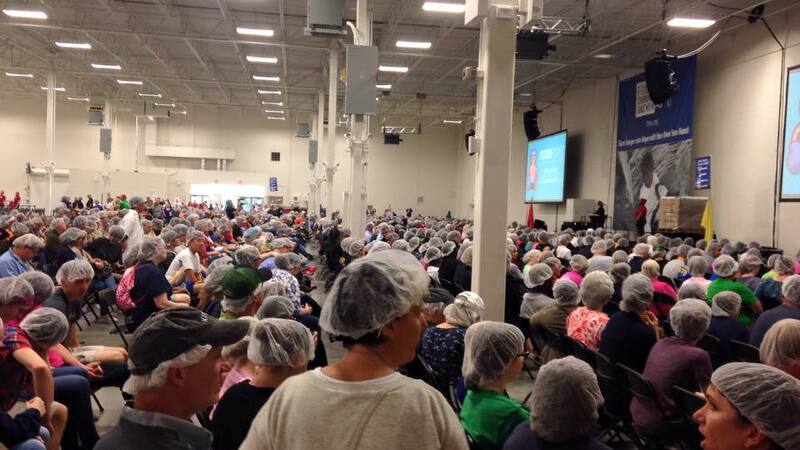 This is what a couple hundred volunteers getting trained on how to pack meals looks like. Shifts moved in and out of the front room while people packed in the back. It worked pretty well! This is what packing looks like. Two volunteers scoop food (one does vitamins and veggies, one does rice and soy). 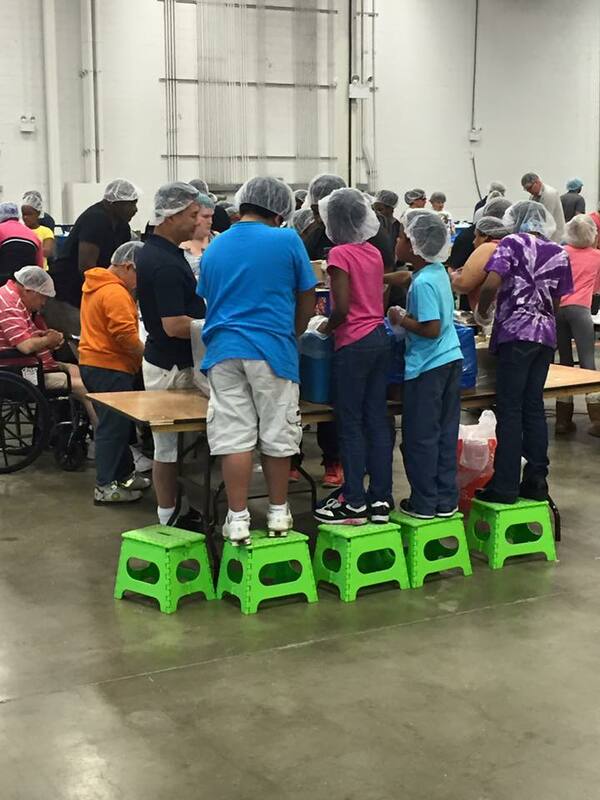 Another 1-2 volunteers open bags, another weighs the food, and two seal. The end of the table has a volunteer who’s counting and boxing 36 meals and keeping track of how many boxes the table sends out. Green people (see pic below) were certified volunteers who acted as helpers, red people were FMSC staff, and blue people (bless their hearts) were warehouse- they RAN rice, soy, and full boxes all over the place! 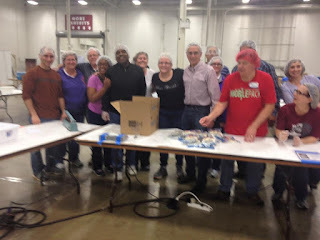 We also had people who assembled bags, refilled containers of ingredients, and weighed boxes. There were jobs for people who needed to sit, and for the Crossfit team that came and ran boxes (and maybe did reps with them while they did it). I had so much fun seeing friends and readers that came out. This is my momma who brought my kids to the 7-10 Friday night session along with some of my oldest’s Boy Scout Friends. They aren’t pictured because they were sitting elsewhere. Kids ages 5 and up could help and a lot of them did an AMAZING job having a good attitude (even if they didn’t get the job they wanted at first) and posted some serious packing numbers!! What I really loved was seeing people who had never met before end up at the same table and working as an effective group after about 4 minutes. It was such an incredible thing. Food Fight also collected canned/boxed goods for the Capital Area Food Bank, so kids here in the States were being helped, too. This was an amazing event to be a part of, and I hope that you’ll chose to get involved next year!